As the sweet cinnamon aroma penetrated the walls of the house we rented at the lake Bariessa last weekend, everyone gathered around the kitchen table: my innocently smiling nephew, who returned from crushing an unsuspecting snail with a heel of his shoe, his sleepy parents who spent half the night soothing their new baby, my kids who just finished practicing for Posturepedic©-bed Olympics…and my husband who never chooses to miss an opportunity to hang out. 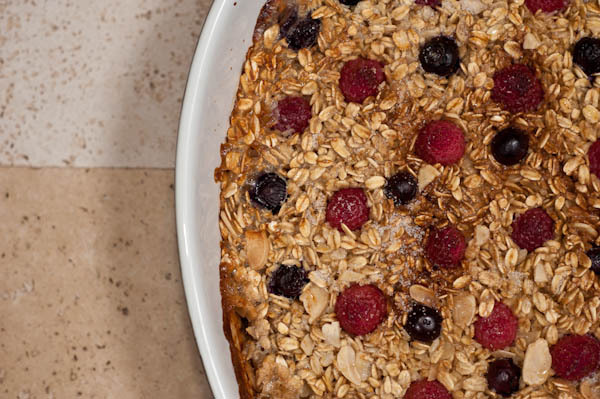 On the breakfast menu is baked oatmeal with fresh berries and almonds – a recipe idea I recently picked up in a new book by Heidi Swanson, one of my favorite food bloggers. The dish is warm and comforty, multidimensionaly textured, and sweetly wholesome… Exactly what the soul craves at 8 am on a rainy weekend morning. This recipe has actually been a pretty good find for our family. 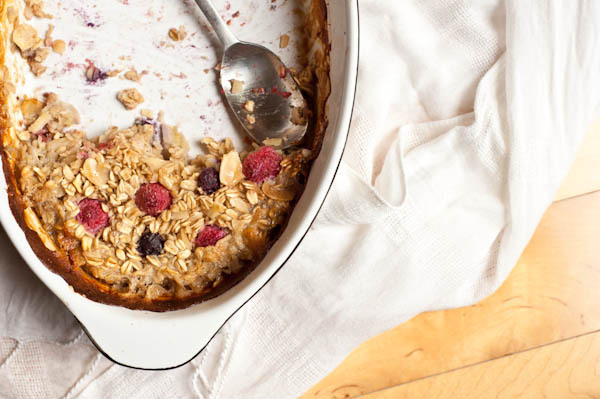 Both my hubby and I really enjoy a creamy bowl of steel-cut oats in the morning (or as a post-workout snack… or a late-night craving-tamer …or even a desert) and greatly value it for all its health benefits. Unfortunately for us, our picky son has never shared our enthusiasm for the grain and has actually been somewhat averse to its goopy texture and flavorless personality. Thanks to Heidi, baked oatmeal is now something he asks for often and sometimes even prefers it over pancakes and waffles. PS. This recipe is a great base. You can pretty much use any combination of fruit, nuts and sweetener and it will come out delicious! I sometimes layer sliced green apples (instead of bananas) on the bottom of the pan, and add diced apple pieces throughout. Preheat the oven to 375 with a rack in the top third of the oven. Generously butter the inside of an 8-inch baking dish. 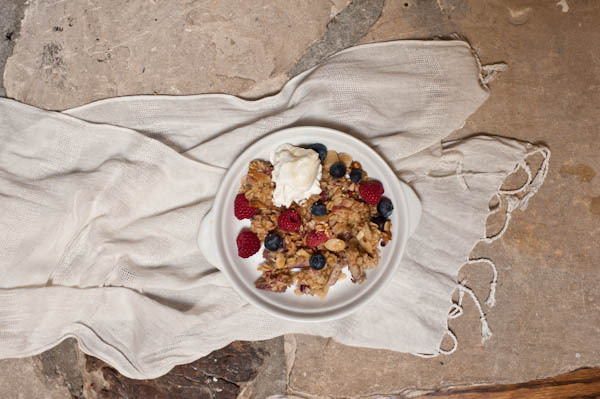 In a bowl, mix together the oats, half the almonds, the sugar, the baking powder, cinnamon, and salt. In another bowl, whisk together the sugar, the milk, half of the butter, and the vanilla. Arrange the bananas in a single layer in the bottom of the prepared baking dish. Sprinkle 2/3 of the berries over the top. 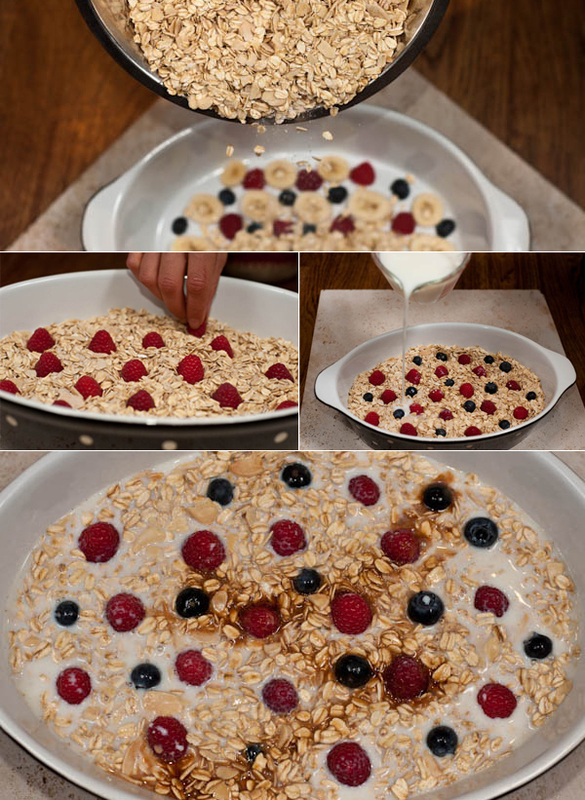 Cover the fruit with the oat mixture. Slowly drizzle the milk mixture over the oats. 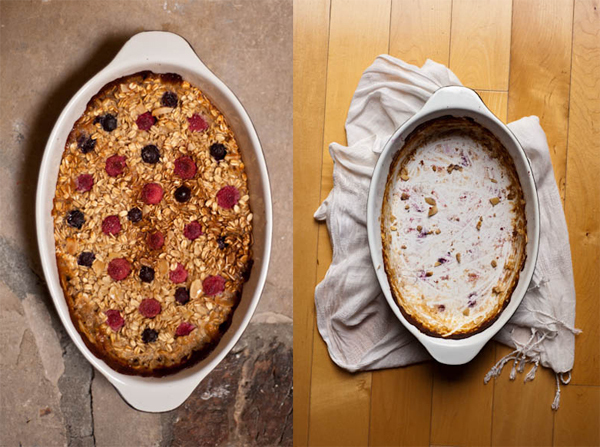 Gently give the baking dish a couple of thwacks on the counter-top to make sure the milk moves through the oats. Scatter the remaining berries and remaining almonds across the top. Bake for 35-45 minutes, until the top is nicely golden and the oat mixture has set. Remove from the oven and let cool for a few minutes. Drizzle the remaining melted butter on top and serve. 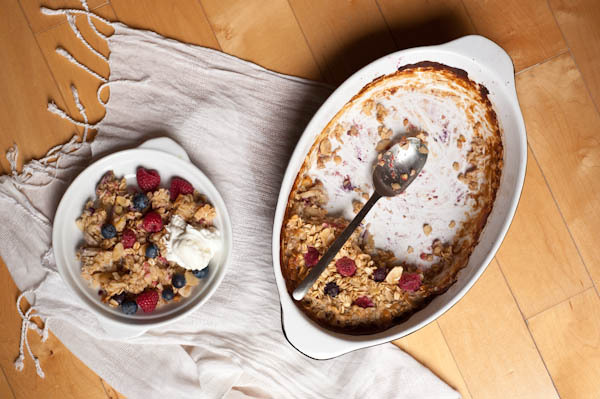 Sprinkle with a bit more sugar or drizzle with maple syrup if you want it a bit sweeter although the baked oatmeal is already pretty sweet! 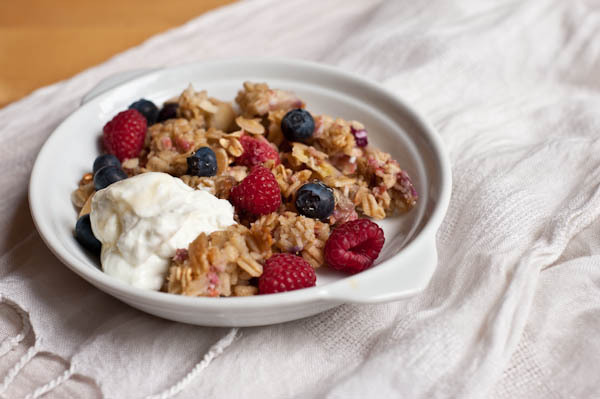 I almost always pour myself a glass of cold Kefir before I dig into a plate of baked oatmeal. The tartness of the drink nicely balances the sweetness of the dish. Get creative and have fun with your cooking There are so many amazing ways to prepare veggie foods . Have you ever tried it with Almond milk? It looks very tasty but I am sensitive to dairy and was wondering if almond milk would be the same? Thanks.